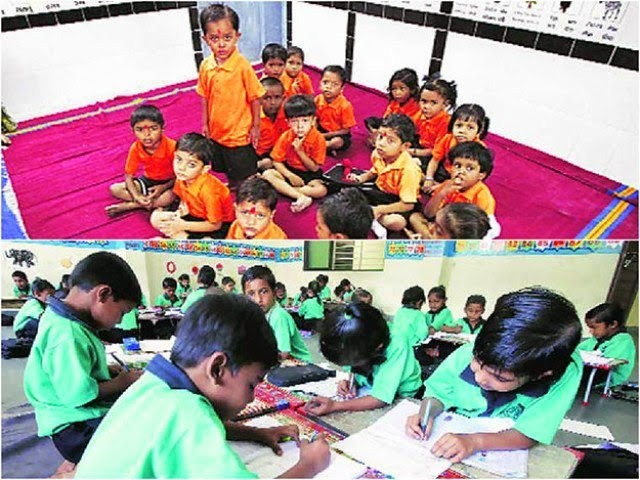 As per the reports from Ahmadabad (12th April 2015) the uniform at Shahpur School, where most of the students are Hindus, is saffron and the color of uniform in Dani Limda school where almost all the students are Muslims, the color is green. This is absolutely shocking! One knew that the ghettoization of Muslims in Ahmadabad is probably the worst in the country but whether the things will go this far was unbelievable. The process of communalization which worsened after the 2002 Gujarat carnage is seeing a new low with incidents like this one. Surely this is the most blatant expression of communalisation- segregation-ghettoisation physical and psychological, which the country as a whole and Gujarat in the most extreme form, is witnessing. While the communities do many times prefer to stay in the localities frequented by their likes, the situation in most of the north Indian metros and even to some extent in smaller towns also is very bad. The segregation of communities along religious lines has gone up to the frightening levels all through. In Ahmadabad, particularly post 2002 carnage the majority of nearly 12% of Muslim population has been forced to live in Juhapura and Shah Alam area, both predominantly Muslim areas. Irrespective of the socio-economic profile the Muslims are not permitted to buy houses in mixed localities. The banks don’t extend their credit card facilities in these areas and neither does eating outlets deliver pizzas etc. in these localities. In India the phenomenon of ghettoisation of Muslim community has run parallel and as an aftermath of the communal violence. Once the violence occurs in a particular city that city is affected very severely and its fallout is seen in other cities as well. In the cities where major communal violence has been witnessed, this has been the invariable accompaniment. The cities like Mumbai, Bhagalpur, Jamshedpur, Muzzafarnagar in particular. In cities like Delhi also this phenomenon is clearly discernible to the extent that even the Muslim faculty members of JNU, the prestigious University with the tag of a liberal institution, also prefer to live in the Muslim majority areas. The builders in the major cities make it a point of not selling the housing units to the members of minority community. I know of a faculty member of the prestigious Tata Institute of Social Sciences Mumbai being denied the house on the ground of religion. Talking of Mumbai, it is probably the most cosmopolitan city with high cultural diversity. In this city the famous film star and social activist Shabana Azmi was denied the house in a mixed locality and similar was the plight of another well known film star Emran Hashmi. There is a long chain of phenomenon leading to such situations where the religion becomes the central marker of one’s identity, overtaking the national identity, and so the right to access to housing of one’s choice is practically ruled out. These are unwritten rules which are part of social practices. As far as ghettoization is concerned, currently we are faced with a debate featuring this phenomenon as talks are on to plan make separate colonies for Kashmiri Pandits in Kashmir Valley. This plan is being opposed by different quarters as this will definitely lead to ghetto like situation for Pandits. The Kashmiriyat culture, the core point of Muslim-Hindu amity in the Valley has already been undermined due to the strife raging in the valley from last over two decades. On the top of that such a scheme of the Government will further enhance the divisive spirit in the state. As such segregation of communities along caste/sect lines is a dominant feature in Pakistan as well, as the dominant political discourse has revolved around complex sectarian divides. The ghettoization of African Americans in United States goes back to the injustices done to these sections in America. Lately one hears a lot about the urban ghettoes in countries like where the immigrants from ex-colonies, not getting their due in the society subsist in the in the poorer areas. How do we deal with such a situation where the divisiveness created by communal politics is ruling the roost? On a visit to Singapore I saw the massive housing colonies in different residential clusters. I was told that within these housing complexes, there is an quota system of allotment of housing units in the same complex along ethnic lines. Different ethnic groups, Malays, Chinese and Tamils have been allotted certain percentage according to their proportion in the population. This does encourage different groups to interact with each other on various occasions and promotes amity between them. What do we do in the face of a situation where the schools are choosing uniforms according to the religion of the children, and how come the percentage of children is overwhelmingly Muslim or Hindu in particular areas? This is due to physical segregation and is contrary to the spirit of communal harmony and the values ingrained in the basics of Indian Constitution, the spirit of Fraternity. One has to counter the myths, biases and prejudices about the ‘other community’ as these stereotypes form the base of communal violence, which in turn paves the way for segregation and ghettoization which further leads to ‘cultural demarcation’, the way these two schools show. What type of future society we can envisage with such stereotypes entering into our education system. The physical and emotional divides which are coming up are detrimental to the unity of the nation as a whole. The communal violence has brought to fore the religious identity without bring in the values of tolerance and acceptance for the ‘other’. I remember having watched V.Shantarams’ 1946 classic Padosi (neighbor) and leaving the theatre with moist eyes, wondering whether Hindus and Muslims can ever live like this again, whether the composite culture which India inherits has any chance of survival in the prevalent divisive political scenario!